The Green Girl ran the Disney Princess Half Marathon this weekend and completed half of the Disney Coast to Coast Race Challenge. 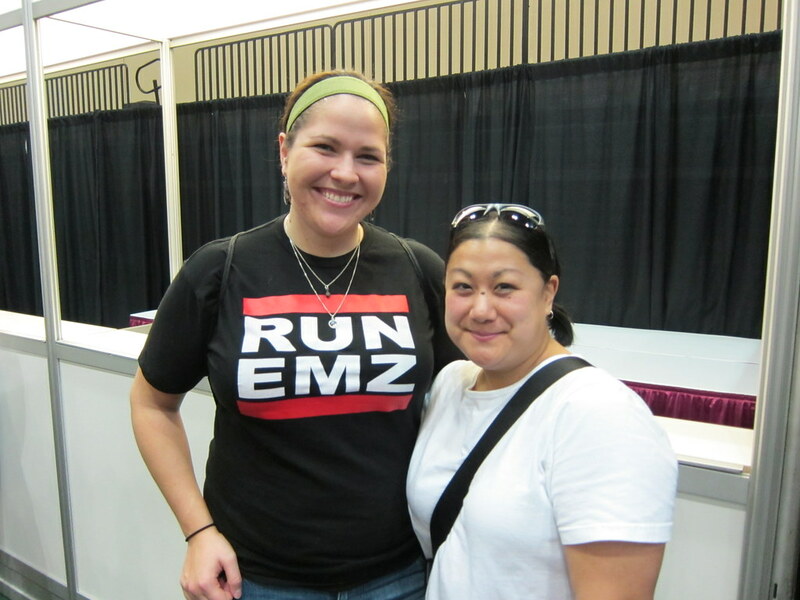 Rad Runner Girl and I attended the Expo on Saturday. The elaborate opening ceremony led by the Fairy Godmother was punctuated by an explosion of colorful streamers. At the entrance, Pixie Dust sprinkled from waving wands. 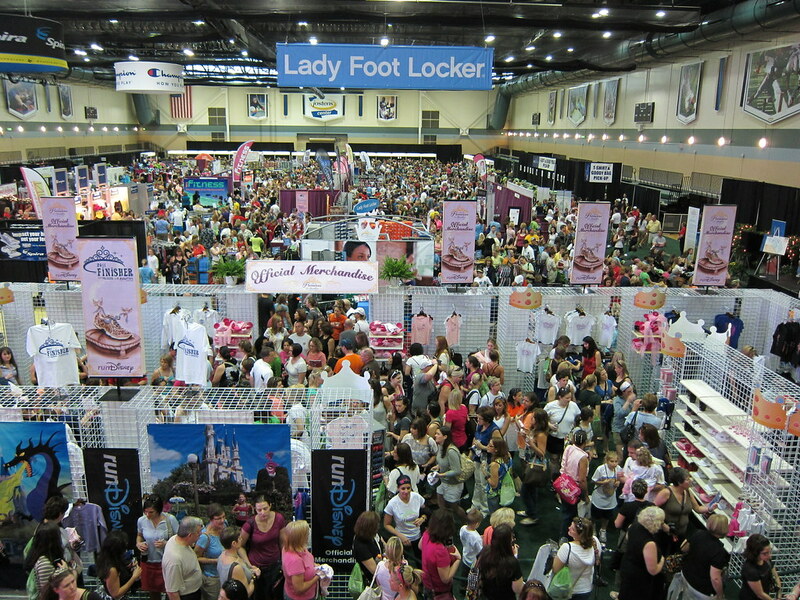 The crowded Expo featured numerous vendors offering princess-themed running goods. After picking up my Princess Snow White bib, green mesh drawstring backpack, and XXL technical shirt, I was thrilled to meet up with Tiina from One Crazy Pengiun. 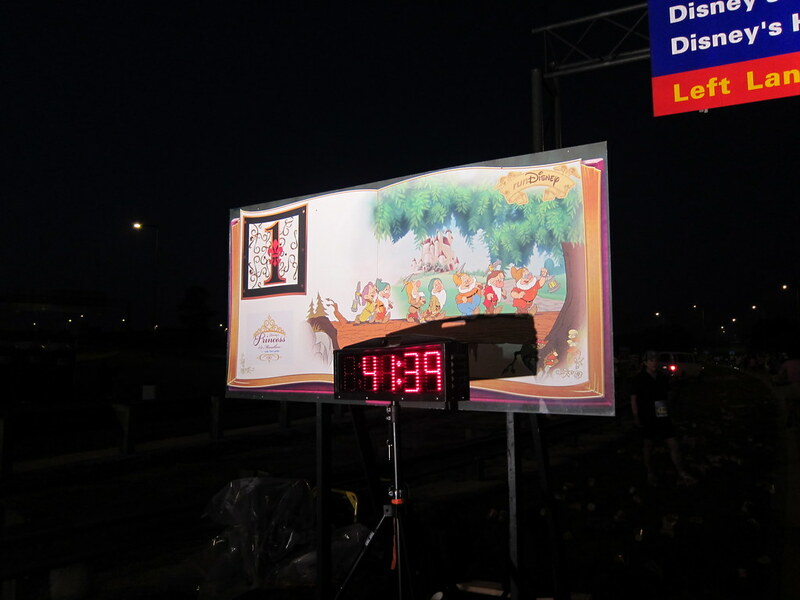 Heeding the warnings of veteran Disney runners, we sacrificed sleep to board the 3:00 am race shuttle. 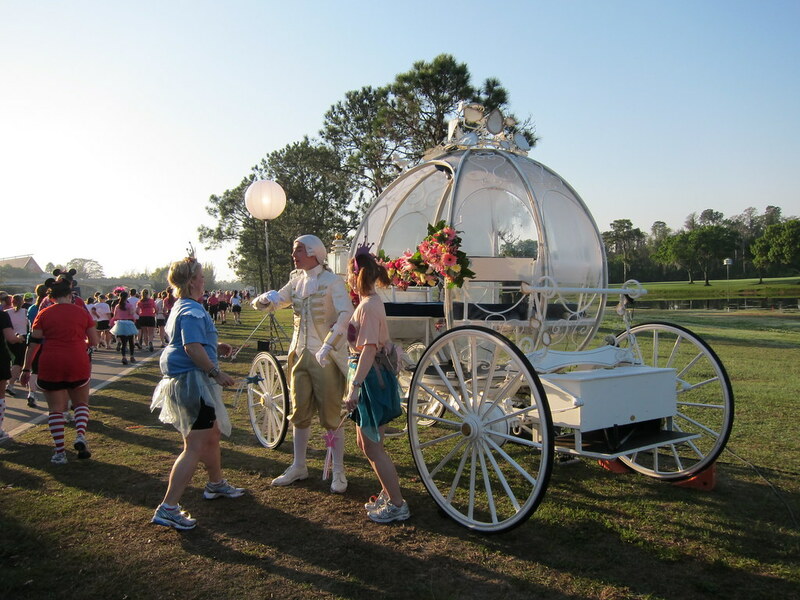 There was a significant walk from the pink tutu and glittery tiara filled pre-race area to the corrals just outside the Epcot parking lot. 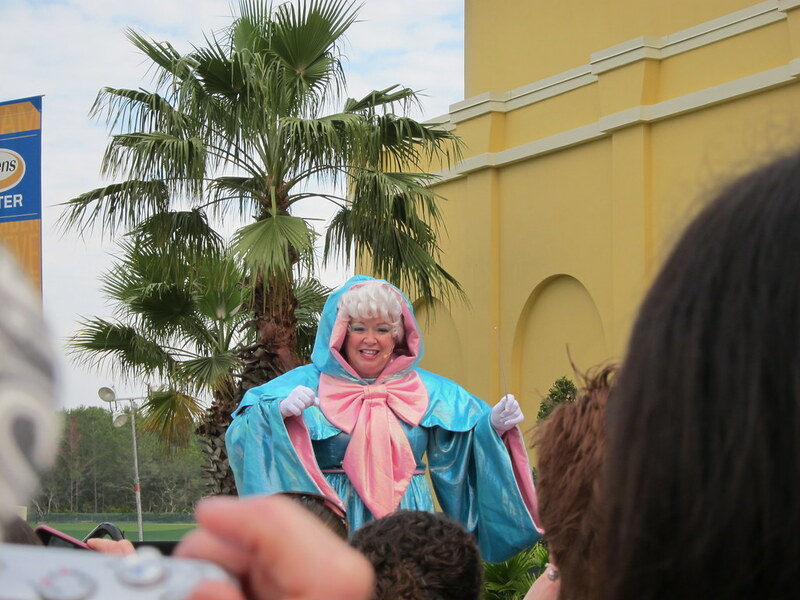 The Fairy Godmother sent each corral off with a flurry of well wishes and a burst of fireworks. The course followed a paved Disney road bordered by grass. It was still dark when I reached the first mile marker. Shortly past Mile 2, there was a giant inflatable replica of the Spaceship Earth. I ran by hula dancers, Disney characters, Taiko drummers, a band, and men jumping on a giant trampoline. Mile 5 took us into the Magic Kingdom and through Cinderella Castle. I saw Kitzzy from See Kitzzy Run and her boyfriend, Jason, around Mile 6. The humidity started to affect me and I started walking more and more. I stopped at every drink station to gulp a couple cups of water and sports drink. I stopped to take a picture with a green Army Man at Mile 10. Tiina from One Crazy Pengiun caught up with me just before Mile 12. At this point, I think I was struggling to maintain a 14 minute mile. Once I crossed the Mile 12 marker, I told myself I could run a full mile non-stop. I dug as deep as I could and pushed to the Finish Line. After I received my well-deserved medal and grabbed a couple of oranges, I met up with Rad Runner, Kitzzy, and Jason. Before we headed back to our hotel, we caught up with Chris from What I Run Into. 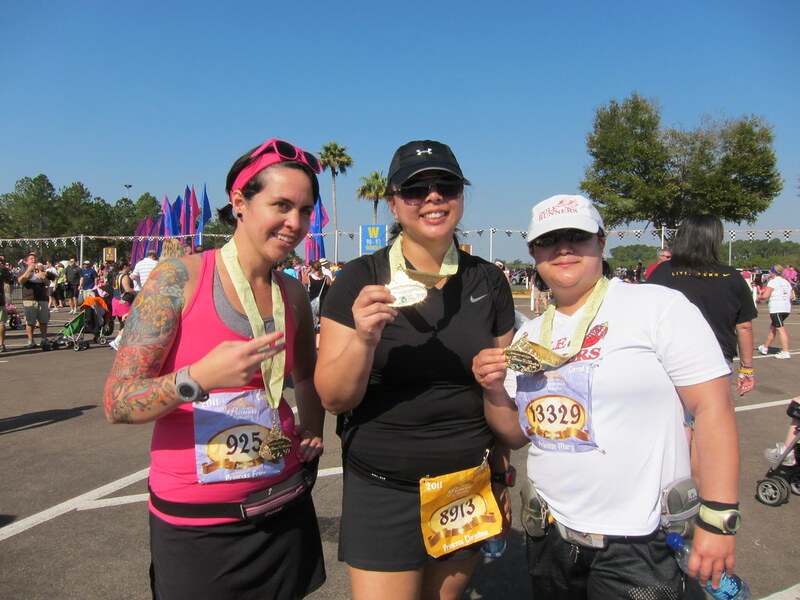 This was my first Disney race experience and it met my expectations for the most part. I felt like the expo was understaffed but the race itself was well organized. There were more than enough volunteers and the aid stations were well stocked. There were more porta potties than I've ever seen at a starting line. I would have preferred to have spent more time running in the park as opposed to the long stretches between Epcot and the Magic Kingdom but the course support was outstanding and it's hard to beat real-life Disney characters in terms of entertainment. I can't believe it's already over. Congratulations on a race well run. 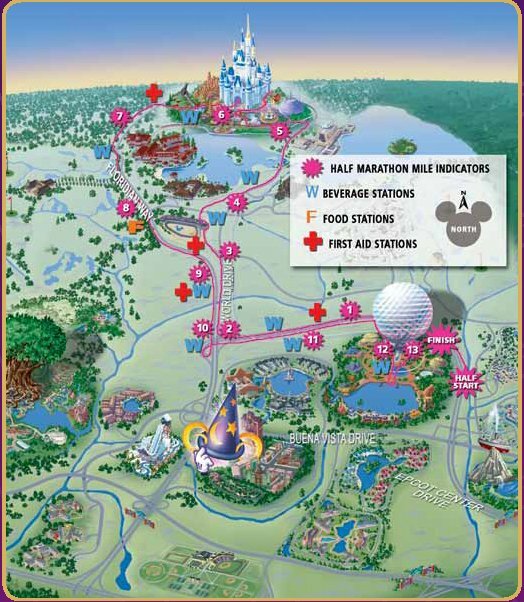 My first half marathon was a Disney half marathon. Loved it. 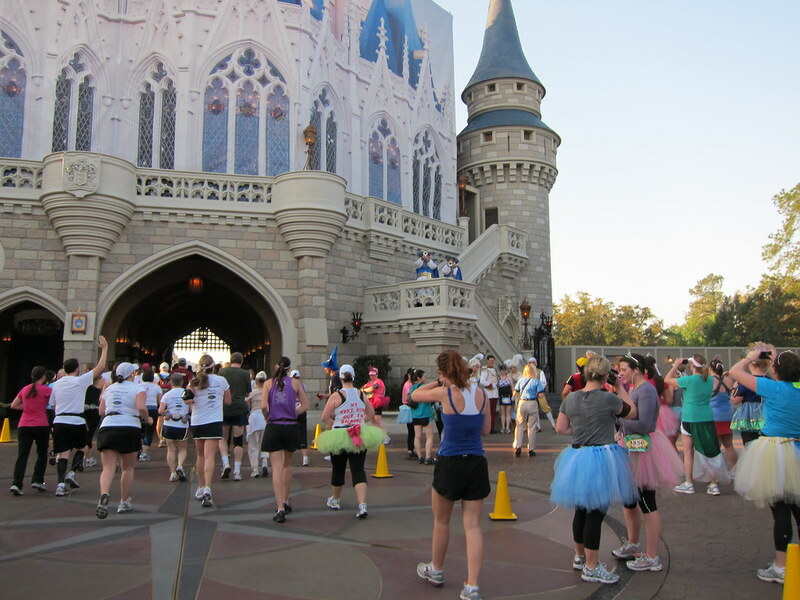 Would have loved to make the Princess Half Marathon. Congrats again! What fun!!! 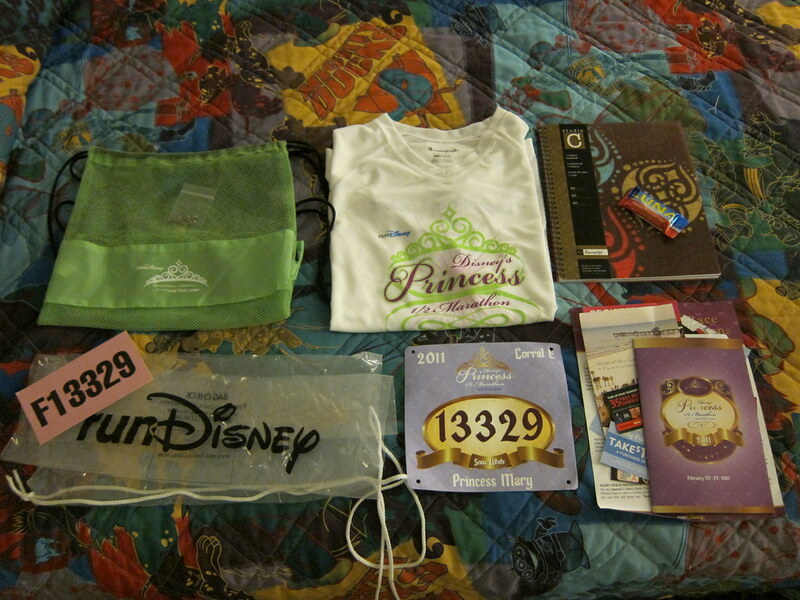 Someday, I too will be a Disney Princess Half Marathon Finisher. Hail to the Green Girl! May all your dreams come true. Congratulations! It looks like a fun race. I'm sorry the humidity got to you. Way to finish strong! yeah, I remember thinking the same thing at the Disney Half here in Anaheim. I guess it's hard to get 13.1 miles of running all inside the park! Outside the park, it was a lot of running in lovely business/industrial Anaheim. Still, sound like it was a great half. Nice finish! Looks like a fun weekend. Great pictures! your awesome. You are like Forest Gump ! YOU JUST KEEP RUNNING AND RUNNING !! Love it girl. Great job, and cool on the meet ups !! Great job! I loved your recap and getting all the details! It looks like you had so much. Congrats on your finish! Sorry for the humidity in my native Orlando. Don't ever visit in August. It's like a sauna. Look at all those bloggie peeps you got to see, how cool was that? I bet that humidity was not fun - one of my fears of running a race there, we have no humidity here in CO so I think I'd have to chug tons of Gatorade, too! Humidity can be rough!! 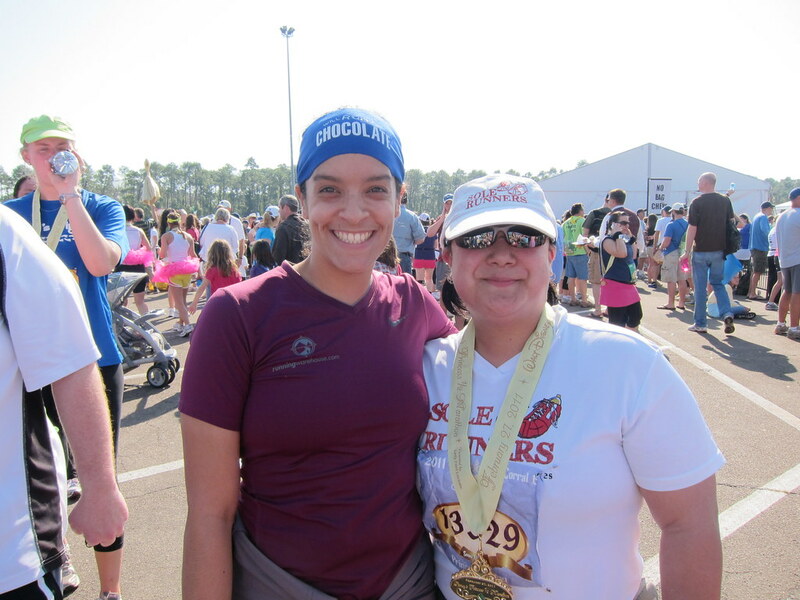 Congratulations on your half! Well done! You did great and it sounds like a very nice race. I wish I could one day go run there and take my son to see Disney. I'll keep dreaming, you never know. Great that you could meet all the other bloggers. Excellent job! And what a super cool course too. Thanks for posting all the great pics.